Keen to get out for a decent spin, and being a long time since our last ride, Shep and I headed to Burgdorf to cycle around the Bernese Oberland. 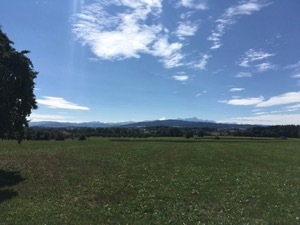 We took the train to Burgdorf and then set off on a circular route taking in the villages of Affoltern Huttwil, Erswil, Wasen, Baerau, Trubschachen, Schangnau, Schupbach, Zollbruck, and Hasle before arriving back in Burgdorf. The cycling was a bit tougher than it should have been (Shep naturally had no trouble whatsoever), but I struggled a little more than I should have done on the fairly steep but short hills. Shep did an excellent job of navigating - seemingly randomly, but picking a great route with well placed and welcome stops for a morning coffee and lunch. Overall it was 110km with 1500m ascent/descent and it took us 4 hours 45 of pedalling. The GPX plot of our route is here. With a lovely day forcast for cycling, but a bit late in the year for the passes to be clear (and warm), I headed to Lake Constance to try the first section on the Mittelland route 5, from Romanshorn to Zurich. After an easy journey there by train, and the usual “where does this route start” faff, I headed off. 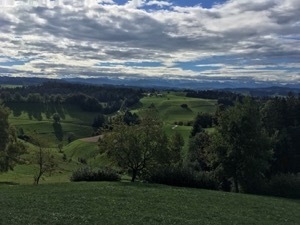 The route follows quiet roads and tracks through the rolling hills of Thurgau towards Wil with lovely views of the Alps and Säntis in particular. There were two marked climbs en-route, both quite easy at a bit over 100m. The first was quite close to the start, and wasn’t a problem except for the very steep last 30m. The second was near the end, and started with about 17% before levelling out to a more reasonable gradient. There was a greater proportion of hard-packed gravel than I would have preferred - next time I might take the Fratello, rather than my road bike - but these sections were also traffic free which made the overall journey very pleasant. The route follows the Thur for a while between Bischoffzell and Wil, and then along the Töss into Winterthur. From there it’s more rolling hills through farmland and woods to drop down into Kloten to finish the route. I didn’t really stop on the way, except to take a few photos of baby ferkels just before Winterthur, and arrived at Zurich Flughaven late afternoon having pedalled for about 4hrs 15 minutes to cover the 94km with 680m ascent/descent. I think the gravel sections slowed me down slightly over what I would have expected given the distance and height. The GPX plot of my route is here. With a bit of a dull day forecast, but keen to get out for a bit of exercise, Jules and I headed off to try to find a fruit Hofladen at Stäfa. Unfortunately the shop we had hoped to visit was closed when we got there, and looked like it had been for some time! We made up for the lack of fresh cherries with a good lunch at the cafe in Mannedorf. Jules declined the full cycle ride back, and took the train. That meant she missed the excitement when my front brake disintegrated en-route, which made some of the turns a bit more technically challenging. Overall we were out for about 2 and a half hours, for approximately 40km. 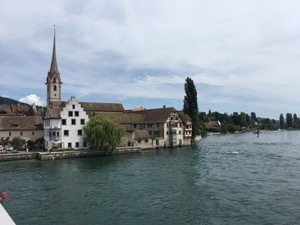 With a good day forecast, and keen to get out for a gentle ride, Jules and I took the train to Stammheim to cycle stage 3 of the round canton Zurich route - Stammheim to Schaffhausen. In bright sunshine, we headed out from pretty village of Stammheim and on to Stein am Rhein. We stopped for a gelato briefly then followed the route from memory as it meandered along the Rhein. We saw quite a few kites and a couple of buzzards, including one very large specimen in a tree for a few moments before it took flight. To Jules' delight, we stopped at a Hofladen for fresh strawberries and to admire their young foal. We arrived in Schaffhausen a couple of hours after setting off and had a cup of tea by the river before dashing to the station for the fast train back to town. Overall a pretty gentle 29 km, with 200m ascent/descent and 1hr 30 pedaling. The GPX plot of our route is here. With a bit of a grey day forecast, low cloud and the possibility of some light showers, Jules and I decided to head down to the southern most end of the Zurisee to try the Veloand route #18 - Obersee Tour. We headed out from Rapperswil with a fairly strong tailwind (which we came to miss later), and made good progress past Schmerikon and on to Grinau. The tailwind then became a headwind as we turned the corner at Reichenburg and it was a bit of a slog from there to Pfaeffikon. We stopped in Lachen for a rather good coffee and cake at Steiner cafe, and also put on our jackets owing to the few spots of rain and the temperature having dropped a few degrees. Suitably reinvigorated and equipped we set off on the last leg back to Rapperswil via the bridge from Pfaeffkon. It's a good route for a fairly gentle ride - all flat and mostly traffic free or on segregated paths. The navigation around the canals can be a bit tricky, but ultimately it doesn't really matter which precise route you take through that network of farm tracks and small roads. Overall the 40km took us about 3hrs of pedaling, and the plot of our route can be found here. With a bright and beautiful day forecast , I decided to head out on my usual route around Fällanden, Greifensee, Egg, and Pfannensteil. I tried a slight variation on the way up to Witikon (which didn't quite work), but quickly settled back into it without any hassle. It's still my favourite local route and took me 1 hr 40 on this occasion, without really stopping. There were great views doing the final ascent up Stuckistrasse to Pfannensteil, with the Rigi in sight as well as the Alps. The route is about 40 km, with 570m ascent/descent, broadly in two equal climbs. A great little morning run. 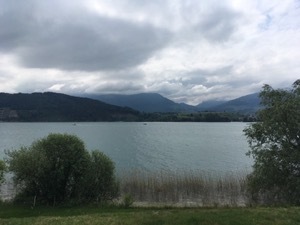 With a pleasant day forecast, keen to do a bit of cycling, but still too early to head over any of the passes, I set off to try a complete loop of the Zurisee. 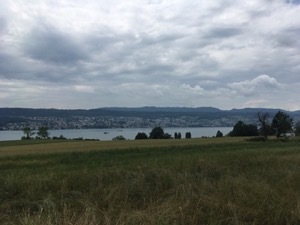 The route I chose was the main roads around the Rapperswil / Zurich / Pfaeffikon section, but then following the cycle paths and small lanes for the Pfaeffikon / Rapperswil part. This route was alright, but did have some sections of gravel tracks (not great on my road bike) and it was slightly slow going on windy country roads. All in all, I'm not sure I'd rush to do it again, although the loop around the south-most section of the lake might make for a nice gentle ride on a summer's afternoon. All in all the 96km took me about 3hrs30, with just a few navigational stops. The return was a bit hard work with a strong head wind, and I wasn't carrying quite enough food (but couldn't be bothered to stop). 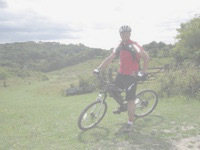 With a lovely day forecast, Timmy-boy and I headed out to Bluach to try circular Route #6 in the Veloland Zurich book. After a slightly navigational error at the start [cough], we found the right way, and followed the route as it wound through the rolling hills of north Zurich. We passed through pretty villages with very traditional architecture farmhouses, and rolling fields and pastures. The first and last legs of the ride were along the Glatt, which is a lovely cycle ride - wide, well made cycle path, well used in the good weather. Feeling good at the end, we decided to head back to Oerlikon, where I left Timmy-Boy, and headed home under my own steam. In total it was 55km (+ 6.5km for the navigational error) for the route, and I tacked on another few km to get home. Once again an excellent route from the book - a very pleasant ride, and exactly as advertised. The GPX plot of our route is here. With a lovely day forecast, I decided to head out on the first fun ride of the year. The chosen route was a variation on route #12 from Veloland Zurich, but starting and finishing in Wintherthur. 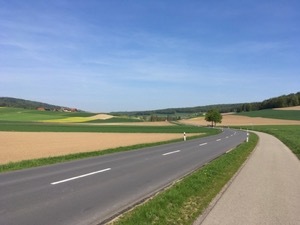 With a bit of a breeze, but overall very pleasant under a bright spring sky, I headed out of town on the flat route along the Töss to Turbenthal. 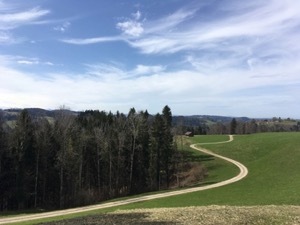 The route then climbed steadily to Schauenberg, then followed the ridge then descends into Hofstetten, before finally looping back to Turbenthal. From there I retraced my route out, following the Töss back to town. I was slightly caught out by the amount of climbing - slightly more hills than expected, but just fine nonetheless. There were particularly lovely views from the top, and a very pleasant cruise along the ridge for a few km (makes a change from the usual up and straight down). Overall it was a good ride, with the extra 32km to/from Winterthur turning it into a nice 70km afternoon ride with 650m of ascent/descent. I was pedaling for 2 hrs 50, and the GPX plot of my route is here.